Jimi Hendrix, despite being the most innovative guitarist of his day, had a fairly limited collection of equipment in his music career. There are a number of reasons for this, his tragic death at the early age of 27 being one of the major ones. In this Jimi Hendrix guitar and gear guide we look at the equipment he used throughout his short but brilliant career – and recommend what modern day equivalents to use to recreate his signature sound. We’ve scanned the web, read interviews and searched through hundreds of forum posts and put together what we think is the definitive guide to getting the Hendrix sound. Which guitar should I buy to sound like Jimi? Which amps did Jimi use? What’s the best amp to buy to sound like Jimi? Which effects pedals did Jimi Hendrix use? What are the best effect pedals to buy to sound like Jimi? Let’s start by taking a look at the guitars that Hendrix used and abused throughout his career. Long before Hendrix became the most famous guitarist, he had already had more than a few guitars. As a child he would carry around a broom to look like the guitarists he idolized, and would later play with a ukulele. Everything changed in 1958. A few months after the death of his mother, Hendrix acquired a second-hand acoustic guitar and began playing with first proper band, The Velvetones. At this stage, all it would take to replicate his sound would be the raw talent and insane level of commitment and passion he had for the instrument. He had no fancy effects, and his acoustic guitar was barely audible over the rest of the band. However, he was already setting up his right-handed guitar in a way that made it more comfortable for him to play left-handed by reversing the position of the strings. After playing with The Velvetones for three months he left the group, and soon after he was able to persuade his father to help him purchase an electric guitar, a white Supro Ozark 1560S. These particular guitars are something of a nightmare to find today, so unless you’re a diehard Hendrix fan with money to burn it’s not worth pursuing. Jimi Hendrix’s First Guitar – The ’58 Supro Ozark 1560S. Image source. He played the Supro Ozark 1560S with a band called the Rocking Kings, and it remained his only electric guitar until it was stolen in 1960. If you’re after something similar, there’s no need to find a guitar which intentionally tries to be like the Ozark. A cheap guitar with single-coil pickups in the bridge position will do the job. Hendrix wasn’t buying a guitar because he liked the way it sounded more than another, he bought one because he needed it and that was all he could get at the time. If you’re just starting out and want to be like your hero, just do the same. Work with what you have. After losing his Supro Ozark 1560S (how do you lose on of those things?!) Hendrix bought his second electric guitar, a 1960s Danelectro bronze standard, which had two pickups. He went on to christen it “Betty Jean” after his girlfriend, and repainted it numerous times in various colours. He only kept the guitar for a short time, eventually selling it to one of his army buddies. 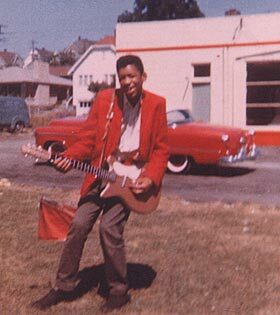 A young Jimi Hendrix posing with his Silvertone Danelectro guitar. Image source. He later borrowed the Danelectro back, for the express purpose of raising enough money to buy another guitar, which ended up being a 1961 Epiphone Wilshire. With the Epiphone Wilshire Hendrix joined the King Casuals in 1962. It’s hard to find an authentic vintage model, but Epiphone still produce Wilshire guitars. Hendrix’s Wilshire had two P90 pickups and a Vibrola tremolo bridge, which is thought to have been a modification. The Epiphone Wilshere. Image source. 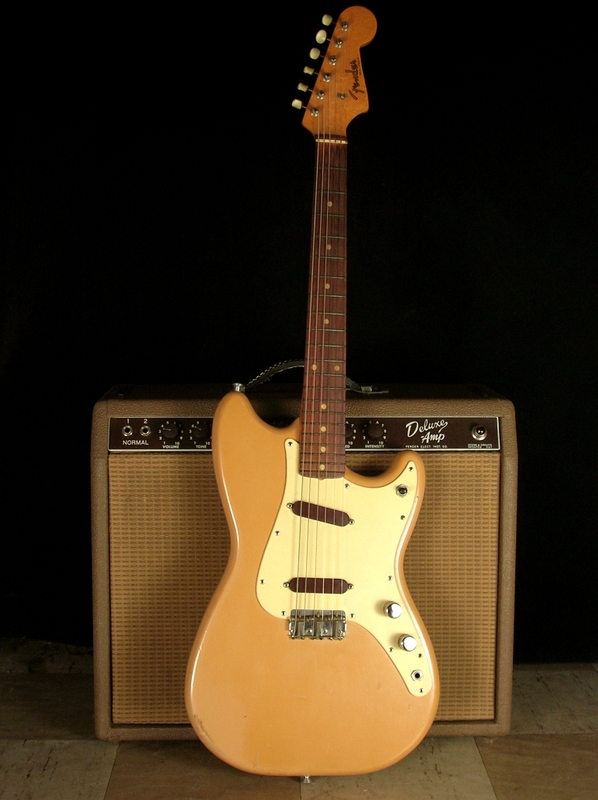 The Fender Duo Sonic. Image source. The tremolo bridge made something of an impression of young Hendrix, and he took it with him to his next guitar, a 1960’s Fender Duo Sonic. This guitar is believed to have been a gift, given to him as a gift when he joined the Isley Brothers as a backing guitarist. It featured two single coil pickups, a modified bridge to include a tremolo, and had a 22.5” short scale rosewood neck. Some confusion has arisen over exactly whether Hendrix was playing a Duo Sonic, or a Duo Sonic II, mostly due to the finish. However, the vastly different design makes it fairly certain that Hendrix had the original version. Before moving to the UK, Hendrix went through a number of other guitars after his Duo Sonic. Whilst touring with the Isley Brothers and Little Richard he was seen using two 1960s Fender Jazzmasters and another Fender Duo Sonic. The white Fender Stratocaster (or “Strat”) is one of his most recognisable guitars ever, and with good reason. When he set a guitar on fire for the first time, it was a Strat. He owned a large number of 1960’s Stratocasters in fact, although not all of them were white. Like most of his guitars, they were fairly standard stock instruments. He would adjust the nut and strings to accommodate for his left-handed playing, but that was usually the only non-cosmetic alteration made. He also preferred having the controls on the top of the guitar as it made it easier to play with the settings. Even when Hendrix became world famous, he was still a fan of Fender Stratocasters and they made up the bulk of his guitars. Jimi bought his first Stratocaster from Manny’s Music Store in New York in the summer of 1966. His girlfriend at the time Carol Shiroky allegedly bought it for him. But as documented in the book Becoming Jimi Hendrix, he trashed the guitar after breaking up with her. The guitar had a white body, and a maple neck with rosewood fretboard. Since meeting Chas Chandler in New York, Jimi played 251 gigs across Britain, Europe and America during his breakthrough year of 1967. By the end of it he was an international star. Assuming you don’t want to buy a vintage second hand guitar, which modern (new) guitars are worth buying? Well, the obvious choice is a Fender Stratocaster which have been in production since their release in 1954 to the present day. The great thing about Strat’s is there is almost a Strat to suit every budget. We wrote a big guide to buying a Strat which you should check out if you’re in the business of buying a Strat. As we’ve seen, even though Strats were Jimi’s guitar of choice from 1966 onwards, he didn’t only play Strats. Later in his career he picked up a number of more expensive instruments, and of these the most well-known are his Gibson Flying V.
We all don’t have this kind of money to throw around on Stratocasters, so for the more budget conscious a good option is one from the Squier Classic Vibe range. Its made using cheaper materials to keep the costs down (and not made in the US) but it’s still a lot of guitar for your bucks. It does however have the maple neck found on more expensive models and some pretty gnarly pick ups. Hendrix also owned a number of acoustic guitars, most of which were far higher in quality than the second-hand guitar he bought for just $5 in his youth. Jimi acquired an Epiphone FT79 in 1967. Like many of Hendrix’s guitars, it was nothing fancy, costing only $25 at the time. Despite this, it was one of the main guitars he used for writing music. His then girlfriend, Kathy, told of how he would take the Epiphone into the bathroom to write music so that he could take advantage of the acoustic echoes from the tiled walls. This was the guitar that was used to compose one of Hendrix’s best known songs, All Along the Watchtower. At the time Hendrix lived in a small London flat, so he was unable to use an amplifier in the way he was accustomed to. In the end, this humble acoustic guitar ended up being one of the guitar’s he used the most. His Epiphone FT79 fetched £209,000 at auction in 2016. Another of Hendrix’s more prominent acoustics was a Martin D-45 he bought in New York in 1969, which he used for composing various songs. He reportedly owned a second of these guitars. Both were passed on to fellow musicians after Hendrix’s death. Hendrix didn’t just stick to regular guitars by any means. He owned a couple of weird and wonderful little instruments along with his giant collections of Strats. One of these was a 12-string acoustic guitar called a Zematis, which was used on the recording of Hear My Train A Comin’. His guitar’s were a huge part of his sonic signature, especially thanks to the unusual way he strung right-handed guitars to make them more suitable for southpaw playing, but as any guitarist knows that’s only half of the story. Let’s take a look at some of the other equipment he used. Before Hendrix discovered his love of Marshall amps, he experimented with a few others, some of them borrowed from other musicians. His first ever amp was a Silvertone Twin Twelve, which he used alongside whatever he could get his hands on at the gigs he played. Although there are more than a few out there, they can be hard to get hold of in good condition. Before the Jimi Hendrix Experience, he went through a few more amps, including Supro Thunderbolts which he used during his time with Little Richard and the Isley Brothers, and Fender Twin Reverbs for a brief time after that. Hendrix was a fan of putting every setting up to the absolute maximum, so he went through amps a lot faster than most guitarists would. Hendrix signed a contract with Sunn after his success at the Monterey Pop Festival in 1967, allowing him to make great use of their amps. One of his most notable Sunn setups involved a Sunn Coliseum 100W head, and 100-F cabinets loaded with a JBL D-130 and an L-E 100-S driver horn. Although a powerful setup, it was described as lacking any midrange whatsoever, so a stack of 4×12 Marshalls were included to help. Hendrix went on to expand the Sunn-era setup to five Sunn Coliseum P.A. tops and ten speaker cabinets with two JBL D-130s. By the time of the Experience tour, Hendrix was mixing and matching a great deal of amps, including the Sunn Coliseum heads, Fender Dual Showman, and Marshall JTM45/100 amps. 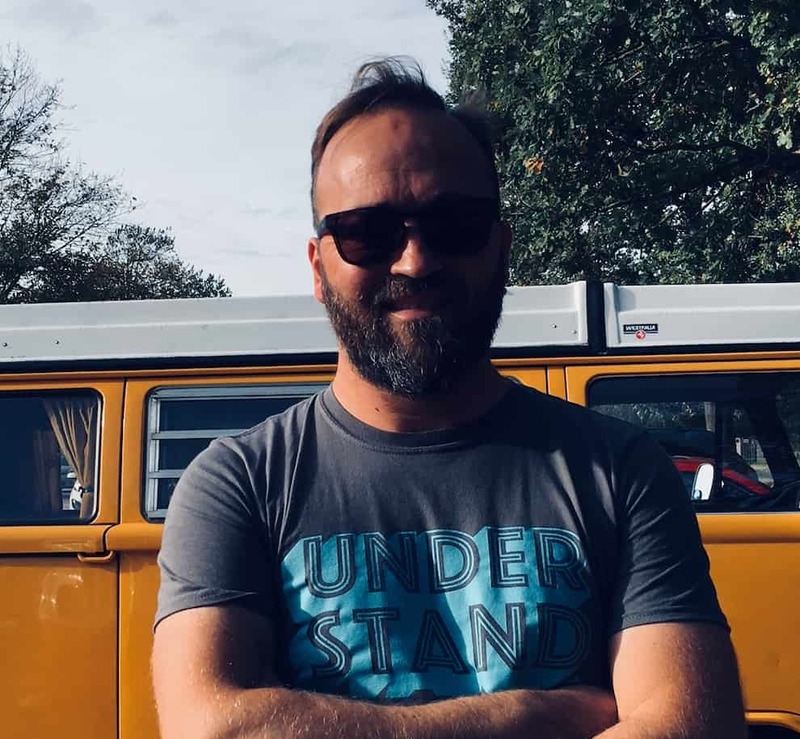 Despite having a five-year contract with Sunn he couldn’t get used to the fact that he simply couldn’t turn the knobs all the way to the right without a ton of unwanted noise, and so he ended the contract after just 14 months. The Hendrix sound that most people recognise today is one defined by Marshall plexi amps. These became more and more prominent in his final years, and he had gone through hundreds of them by the time he died. These are a feature of his later work, so we’ll cover that in more detail when we get to that section. The key to achieving his earlier sound is found in the advice he gave to Sunn whilst he helped them with their research and development: “the minimum acceptable power at that time was 100 watts.” Hendrix liked volume, so don’t be afraid to blast it. In fact, it caused more than a few arguments whilst they recorded his debut album, as the overwhelming noise made the tiny apartment they used for a studio to rattle and this kept spilling into the tape. However, a 100-watt amp cranked up the the highest settings possible is more likely to be an inconvenience. Unless you’re playing gigs in decent sized venues, all you’re going to achieve is the discomfort of anybody who has the misfortune of standing too close to the speaker cabinets. It’s also going to cause you to blow out the speakers regularly, and unless you’re earning a good living from your music or have a contract with somebody who can supply your gear for you like Hendrix himself did, then you’re going to be looking at unacceptably high expenses to replace absolutely essential equipment. It’s just as easy to use a smaller amp, as low as 40 watts. Rather than pushing the settings all the way to the maximum, you dial it back a little and still get the same room filling power without the risk. This lets you get into that nice crunchy overdriven tone whilst still leaving yourself with some working electronics. Assuming you don’t try and track down a vintage amp (if you do, we applaud you) there are a few modern options that are worth considering. Of course, if you know anything about Hendrix at all, you’re probably aware that there are a few effects pedals that are so strongly associated with his particular sound that there have been plenty of later versions that bear his name as a mark of tribute. The amplifiers Hendrix used were an important part of how he achieved that tone, but without the effects pedals you’ll still be missing something. Before we go on to cover what effects pedals he used and how, there’s a couple of points you need to know. Hendrix often used a clean tone. We tend to think of his music as having a constant fat and dirty sound, but that’s more of a general impression than an accurate description. 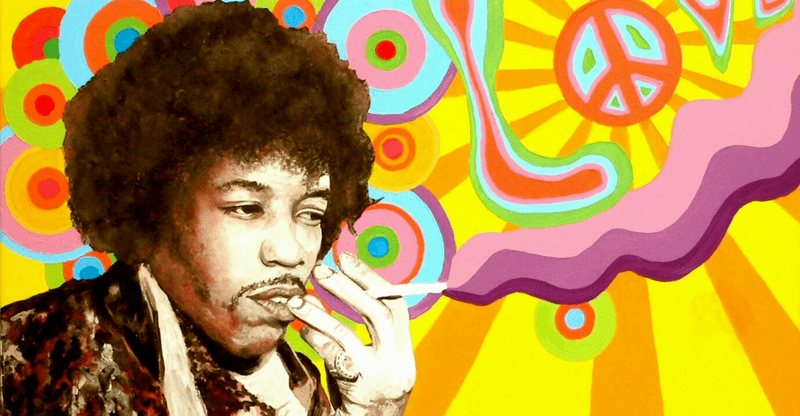 If you want to sound like Hendrix when you play, you’ll need to incorporate this as well. Hendrix used a 1966 Marshall Super Lead 100 Watt amplifier head (similar to this one above) in several concerts from 1967 to 1969. They don’t come cheap, but they sound incredible. The exact method of doing it varies from one guitarist to another. Many will use a separate channel for their clean tone, but what Hendrix did was to simply dial back the volume knob on his guitar. This gives you a far more nuanced control and lets you have a much more natural transition between the two. In fact, Hendrix was constantly fiddling with the volume on his guitar whilst playing, so if you’re not used to actively using it during songs it’s a skill you’re going to need to practice. But a clean tone isn’t enough, nor is it anywhere near as fun! So let’s move on to Hendrix’s favourite pedals and how he used them. In Hendrix’s early career he didn’t use much in the way of effects pedals, mostly because they hadn’t really been invented with the exception of a few very basic ideas. By the 1960s this changed and Hendrix was a pioneer in their use. Now before we continue, it’s important to clarify something. Hendrix didn’t own a large number of pedals. All told, you only need about four to recreate the majority of Hendrix’s music. The exact models used by Hendrix can still be found, but there are more contemporary versions of the same effects that are more reliable, cheaper and easier to find. It’s up to you whether you go for an authentic copy of his effects pedals set up or if you don’t mind having a faithful adaptation. However, if Hendrix had been alive today you can bet your last penny he would have moved with the times, so don’t feel guilty for wanting to have a slightly more modern sound! Hendrix didn’t use every pedal he owned in every song he ever recorded. He would use his pedals in varying combinations, and actively switched through them during different parts of a song. This doesn’t mean you’ll need to get into full-blown shoegazing style guitar playing, but you won’t be able to just ‘set and forget’. If you were to cover a number of Hendrix songs, you’d have to get used to changing the settings between songs. With that in mind, here are the four essential guitar pedals you need to sound like Jimi Hendrix. Hendrix used this pedal to create an intense and memorable intro for the song Voodoo Child, although there are plenty of examples throughout his career of highly creative uses of this simple effect. In fact, a decent Wah pedal is so useful that you should really get one sooner rather than later, as it’ll have a great many applications beyond Hendrix cover songs. For a modern replacement of the Vox Wah Pedal, you could go with either the Jim Dunlop JH1D Jimi Hendrix signature pedal, or the Jim Dunlop Crybaby pedal. Both of these are excellent, but as the name suggests the Hendrix signature pedal is going to be the best way to replicate his songs as closely as possible, whereas the Crybaby pedal is equally good but will give an ever so slightly different sound. In this case it depends how determined you are to play with zero differences between yourself and Hendrix, or if you’d rather have your own variations here and there. Another indispensable element of Hendrix’s effects pedal setup. A fuzz pedal is the key to creating powerful sounding riffs and licks. These let you fatten up the chords and allow solos and other lead parts to wail. If Hendrix hadn’t had a fuzz pedal, many of his songs would have sounded much flatter and far less iconic. There’s absolutely no way you could get by without the use of a Fuzz pedal either. If using equipment from the 1960’s isn’t your style or you just can’t find one, you’re in luck. Once again there is a Jimi Hendrix signature pedal by Dunlop that you can use for guaranteed results. The Octavia was the original and arguably the best octave pedal ever made. As the name suggests it adds an extra octave to whatever note is being played, and because these were analog they were able to account for all of the tonal variances that would come from Hendrix’s guitar playing technique. There are many different clones of the Octavia available, but they tend to be a little off the mark. For the Octavia pedal you could go for one of the many different Octave Fuzz pedals that are on the market, but Roger Mayer Octavia pedals have been continually improved and developed since Hendrix famously used them, and there’s no real challenger to their quality. However, if you’d rather go with another brand then Electro-Harmonix do a great version of their own. The original Univibe pedal was almost entirely an accidental creation. Shin-Ei had been trying to mimic the sound of rotating speaker cabs, but instead of achieving that goal they created the univibe instead. It’s a very difficult effect to describe, being a combination of many other types of effects whilst at the same time being unique from them all. It’s one of the crucial elements that made Hendrix sound so unique. In fact, because univibe pedals tend to give such an unusual characteristic to guitars, they are an excellent way to distinguish yourself from the rest. These were the main pedals that Hendrix himself used, and if you’re going to be replicating his sound you can’t really do any better than using the exact same equipment. However, for one reason or another it’s going to be fairly impractical to actually get all of these items. A better suggestion is to get look for modern alternatives. There are several excellent clones out there, and there are even a few made specifically to help other musicians get that Hendrix vibe. When it comes to the UniVibe pedal, there’s very little chance you’ll be able to get your hands on an original Shin-Ei 1960s Univibe. Thankfully, modern alternatives are designed with Hendrix in mind, and one of the absolute best, and also most popular, univibe pedals around today is the Fulltone MDV-1 Mini Deja-Vibe pedal that uses analogue circuits and other authentically retro design aspects to create something that sounds like it would have been around at the same time. The only difference is you won’t have to hunt to the ends of the Earth to find one. Hendrix was not only an innovator in terms of gear, he also pushed the boundaries of how you even play a guitar. One of Hendrix’s many bits of brinksmanship was playing guitar with his teeth. Let’s quickly look at Hendrix playing with his gnashers. So, how do you play guitar with your teeth? Well, there is no right way to do it. Guitars aren’t supposed to be played using your teeth, so don’t let anyone tell you that their method it the ‘correct’ method. However, there are a few things that make plucking the strings with your teeth a bit easier. Here are 5 tips, to help you take your showmanship to the next level. The back of your front teeth on your top row of teeth should be what’s doing the plucking. So, as you attack the strings, the plucks will be ‘upwards’, in the same way as you’d do an upstroke using a pick. It’s literally like biting your strings. And not that difficult, is it? Playing past fret 12 is essential when you’re plucking with your teeth! If you go too low, not only will it be difficult to reach the frets, but the vibrations of the strings will be much more violent and hard on your gnashers! Using pull offs and hammer ons will make your teeth-plucking more manageable, as you need to pluck less regularly than if you were to play each note staccato. However, take care not to overdo this… Else you won’t really be playing with your teeth, will you? Doing loads of bends will help ensure that your flashy soloing trick actually sounds good to the audience. If you play a simple solo on high up frets, which uses a lot of bends, it will sound good even plucked with your teeth. If you start trying to play staccato notes, and neglect your smooth tricks, it will not sound great and your audiences will wish you hadn’t bothered! A practical thing here. If you’re going to be lifting your guitar up a metre or so higher than usual, you’re going to need to make sure your lead is long enough to cover it. Make sure there’s plenty of length, otherwise lifting your guitar to your face might result in pedals dangling in the air! So, bite at your strings, keep the notes high, and ensure that your licks are legato and your leads are long. Jimi was a legend, a one of a kind. Jimi Hendrix’s guitar and gear were only one element of his magic of course, but hopefully this article has given you a good idea of the kit you’ll need to reproduce his epic sound. What are we missing? Add it in the comments below.